Five players have formed the core of the Bangladesh team. Shakib Al Hasan, Tamim Iqbal, Mashrafe Mortaza, Mushfiqur Rahim and Mahmudullah play different roles in the team. In addition to leadership roles, they hold the batting and bowling together. They also deal with the ever-growing expectations, provide a hand on a rookie player's shoulder, decide what their jersey's colour scheme should be, and where the team dinner will be held. In essence, these five players have a whole lot of responsibilities in the team, but they are mainly judged by their own performances. Tamim and Mushfiqur had stepped up against England and Australia in the Champions Trophy, but there was greater pressure on Mahmudullah, Mashrafe, and Shakib ahead of the must-win match against New Zealand in Cardiff. They soaked up the pressure and delivered. Mashrafe led superbly before Mahmudullah and Shakib lifted the team from 33 for 4 with a 224-run partnership - the highest for Bangladesh for any wicket in ODIs. Both Mahmudullah and Shakib hit centuries to lead Bangladesh to a memorable win. Having suffered several injuries, Mashrafe isn't the bowler he was. He predominantly plays as a captain, but continues to prove his critics wrong. 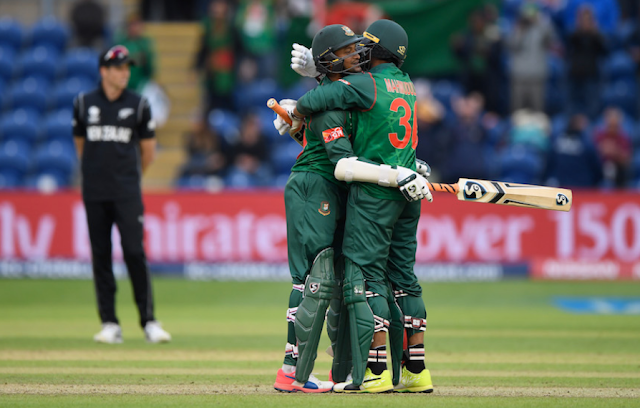 He bowled important spells in Cardiff and showed why he is Bangladesh's second-highest wicket-taker since the 2015 World Cup. In fact, he is the second-highest wicket-taker among active players in ODIs, after Lasith Malinga. Mahmudullah, too, doesn't quite get the treatment he deserves. His place in the team is perennially questioned: when he does well, popular opinion is that he could have batted higher and when he doesn't do well, he gets dropped hastily. Both Mashrafe and Mahmudullah have learnt to handle such questions. Shakib, on the other hand, is a certainty in the XI. He is Bangladesh's best cricketer, the world's best allrounder, and one of the most experienced middle-order batsmen in ODIs. In fact, he is one of only four batsmen to have batted at No. 5 for more than 100 innings in ODIs. He hardly goes out of form but even when he suffers a dip, Shakib himself is the last person to get worried. Before the match against New Zealand, he had not scored an ODI hundred since 2014 or hadn't won a Man-of-the-Match award since September last year. But he understands his game so well that he habitually senses that a big innings is around the corner. Most coaches and captains continue to back him. Shakib's batting, though, has suffered due to his continuous presence as a lower-order batsman in T20 leagues. It might have increased his range of shots, but has dented his overall approach. Sometimes, he tends to enforce his high-profile image. Looking to get on top of the opposition bowling when they are in control is risky, and Shakib has achieved it with mixed results. Against New Zealand, he rode out the tough period when the ball was still swinging, before opening up and putting the bad balls away. He sensed that Kane Williamson wouldn't have much firepower in the slog overs and took advantage of it. He had contributed with the ball as well. He did not try to overwhelm the batsmen; instead he kept asking questions with his length and finished with 0 for 52. Having played ten years at the highest level, Shakib has resisted himself from one of the striking traits of Bangladeshi personality: talking. He lets his bat and bowl do that job. They don't call him Mr. Cool for nothing. Shakib doesn't indulge in talking himself up, down or on either side of any issue. He doesn't brag about himself in interviews, despite being one of Bangladesh's biggest superstars across all spheres. His business interests hardly create a splash while his endorsements are as mundane as those for Indian or Pakistani cricketers. He has had to contend with controversies as well: making a lewd gesture towards the camera which earned him a three-match ban, allegedly beating up a spectator who was bothering his wife in the stands, and threatening to quit international cricket in July 2014. The last two incidents earned him a six-month ban from the BCB that was later reduced, and since then he has gone more into his shell. He, however, doesn't mince his words, neither does he speak ill of anyone in public. He once pointed out that the Bangladeshi meal isn't sufficient to develop big hitters. Perhaps, it needs more orange juice, he said, but that's about it. Mahmudullah wouldn't even say such a thing, unless it is in the confines of the Bangladesh dressing room. He is known as the lead prankster and in 2012, was outed as the best Gangnam-style dancer in the team. He has a wicked sense of humour, which is never on show in public. He has also been known to be ridden with self-doubt, which was evident during his 18-month drought in 2013-14. He then hit back-to-back centuries in the 2015 World Cup, but still couldn't quite hold onto to his top-order slot. Instead, he was asked to become a finisher in the limited-overs formats, particularly in the T20s. He aced that role for nearly 12 months but again fell into a slump, starting December last year. Things went from bad to worse when he was dropped for Bangladesh's 100th Test in March this year. The team management even thought of sending him home from Colombo for a few days to avoid walking on eggshells in the dressing room. Nazmul Hassan, the BCB president, later intervened as he was kept in the squad for that game. Subsequently, he was retained in the ODI squad even as there was reports that he was about to be dropped. Mahmudullah regained some confidence with a match-winning 46 against New Zealand in Dublin last month. Questions about his ability still lingered. He faced only six balls for six runs against England in the Champions Trophy opener before playing a poor shot against Australia's Adam Zampa and falling for 8. He then produced a sensational hundred against New Zealand and earned himself more breathing space. But Mahmudullah will be wary of complacency. Mashrafe might not sit back and relax either. He has had a rough few months since December last year, culminating in his retirement from T20 internationals. It was said that he had beaten the BCB to the punch by announcing his retirement during the toss of the first T20I against Sri Lanka because there was pressure on him to quit the format. Mashrafe, though, continues to be Bangladesh's best bowler in ODIs - be it with the new ball or the old one. On big occasions, he can still generate swing and seam movement that often goes unnoticed by batsmen who try to hit out. His lack of pace can also fox batsmen. It is also hard to deny his overwhelming presence on and off the field in the Bangladesh set-up. Mashrafe has to tackle the player-management relationship front on, but striking a balance is hard in an environment that is often riddled with uncertainty He also has to goad the younger members while still bringing the best out of the senior players when they are out of form. Tamim has spoken at length about how Mashrafe took special care of him during the 2015 World Cup. Mashrafe might not do the same with Shakib, Mushfiqur and Mahmudullah because he knows there are other ways to perk them up. He has the knack of accepting brutal reality, and can cope with things not going his way in the field or during meetings in the dressing room or the team hotel. Mashrafe and these four other senior cricketers continue to play with great care and responsibility for Bangladesh, setting examples on and off the field for future generations. They are the embodiment of Bangladesh's rapid progress, and they still have many miles to go.